Database Systems Corp. (DSC) provides phone systems and software for contact centers in a variety of locations and markets. Our 911 Broadcast division of DSC provides emergency alert systems and services to both communities and corporations. To provide these emergency alert services, DSC has developed state of the art phone systems that are capable of sending thousands of phone messages to communities in just minutes. To deliver volumes of emergency alert messages to your community residents in the event of a disaster, our emergency phone dialer was developed to broadcast voice messages in a fast and efficient manner using either a single system or a network of phone systems. In the event of a natural disaster such as a forest fire or a blizzard, your community members can be notified quickly and given specific instructions. If an evacuation is required, this emergency broadcast system can deliver instructions to the community. DSC provides both an entry level emergency phone dialer called the WIZARD. This system supports up to 48 analog phone lines. 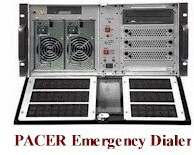 Our PACER emergency phone dialer supports hundreds of digital phone lines and can be networked to provide virtually an unlimited number of outbound lines for large scale emergency broadcasting. 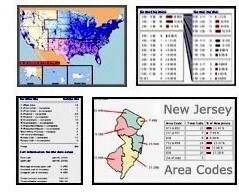 Our emergency broadcast dialers and services are significantly different than typical message dialers. To call a community of 10,000 households could be accomplished within 10 minutes compared to over 3 hours with a typical 48 line emergency message dialer. Our service is capable of leaving messages for both individuals and answering machines. We can also re-dial numbers when there is no answer or a busy signal. A "press through" feature lets a resident confirm the receipt of the call, leave a voice mail message, or even transfer to one of your response team members. All of this is possible using technology brought to you by Database Systems Corp. We provide both emergency broadcast service as well as emergency notification systems. Contact DSC to learn more about our emergency notification systems and services. Crook County utilizes our 911 emergency autodialer services to contact state employees in the event of an emergency. Emergency phone messages are sent to employees notifying them of any emergency situation. Messages also are sent informing employees of the nature of these emergencies and where to contact their emergency center for specific information and instructions. The DSC emergency phone dialers are easy to install and operation. During an emergency, simply record your phone message offline or use our toll free phone service to record your message. Next identify your call recipients using a simple list manager or a graphical map display and send us your phone numbers via the internet. You can also identify pre-defined lists to call using simple touchphone responses on our toll free service. We do the rest. Our emergency notification system delivers messages to individuals or answering machines and can allow the call recipient to make touchphone selections. This may be critical if your response center requires a positive acknowledgement from the call recipient. Our emergency notification phone dialers and computer telephony products fully support remote agents. Now your workforce can be significantly expanded with the addition of work at home employees. The economic savings and environmental advantages are significant. To obtain additional information about our remote agent capability with our emergency phone dialers, contact DSC today. Contact Us Today to learn more about our emergency phone dialers and services.